National Pig Day is an event held annually on March 1 in the United States to celebrate the pig. The holiday celebration was started in 1972 by sisters Ellen Stanley, a teacher in Lubbock, Texas, and Mary Lynne Rave of Beaufort, North Carolina.According to Rave the purpose of National Pig Day is “to accord the pig its rightful, though generally unrecognized, place as one of man’s most intellectual and domesticated animals.”The holiday is most often celebrated in the Midwest.National Pig Day includes events at zoos, schools,nursing homes, and sporting events around the United States. It is also recognized at “pig parties” where pink pig punch and pork delicacies are served, and pink ribbon pigtails are tied around trees in the pigs’ honor.According to Chase’s Calendar of Events, National Pig Day is on the same day as pseudo-holidays Share a Smile day and Peanut Butter Lover’s day.The question of whether the holiday is a time to honor pigs by “giving them a break” or to appreciate their offerings (spare ribs, bacon and ham) is an open question. in Lexington, Kentucky, a nursing home celebrated National Pig Day with a porcine parade that included a display of pig collectibles such as porcelain pigs, pig potholders, piggy banks, and pigs made from calico and cross-stitches, as well as a real-life Vietnamese potbellied pig named Stella who “hogged the day.In the Lehigh Valley, National Pig Day in 2008 was honored with single-game tickets to the IronPigs’ 73 home games at Coca-Cola Park, including the IronPigs-Philadelphia Phillies exhibition and Opening Day, going on sale to the general public. the celebration was described as a “sporktacular” day in franchise history by the team’s General Manager Kurt Landes who said, “We look forward to doing our part in making National Pig Day an openly celebrated date in the Lehigh Valley!” Highlights of the National Pig Day also included plans for a pig roast featuring complimentary food and beverages, appearances by the IronPigs mascot Ferrous, and a variety of activities for children including pig crafts, IronPigs tattoos, and a chance to pin the tail on Ferrous. In Illinois the celebration of the “often disrespected species” is done with “good reason”: the pork industry contributes $1.9 billion to the state’s economy. when National Pig Day coincided with the Year of the Pig in 2007, described as a porcine nexus, Illinoisans watched a 50 lb (23 kg) miniature pig named Pinto from the Yucatan display sporting abilities (guiding a ball into a soccer net and using his snout to push a basketball up a ramp into a hoop) at the Brookfield Zoo and many fans donned pig snouts and caps for the festivities and parade. A handbook for first year teachers includes National Pig Day as a seasonal activity and recommends cooking bacon, making BLTs, and discussing where pork chops come from.At the Tisch Children’s Zoo in New York’s Central Park, National Pig Day is usually celebrated with the help of pot-bellied pigs. In 1998, two nine-month old piglets named Thelma and Louise and their 185-pound companion named Speedy greeted visitors, while the children’s zoo also held a “snort off” competition for children. in 2009, the Vietnamese pot-bellied pigs at the zoo were named Oliver and Otis; they were reported to have “hammed it up and stole the show at the seventh annual National Pig Day celebration at the Children’s Zoo,” though, in general, reviews of the pigs were mixed. On Long Island a family gives their pot-bellied pig a special treat, refrains from eating pork and prepares a special National Pig Day meal. At the Suffolk County Farm in Yaphank, the Cornell Cooperative Extension celebrated National Pig Day by sponsoring a pig program. Families visited farm pigs where “the piglet cuddled today will soon grow to 220 pounds and wind up in ‘hog heaven. '” The meat from the farm is fed to the inmates at the Suffolk County Jail, “so it was a strange day viewing pigs as if they were in a zoo, but knowing that their time was limited… except, of course, for the stud pigs, or boars, and their ladies-in-waiting, the soWas. Miss Piggy and Porky Pig were honored and porcine facts presented: the world’s largest pig weighed 2,660 pounds, and pigs sailed with Christopher Columbus. Saint David is the patron Saint of Wales and March 1 is St David’s Day. This day was chosen because tradition holds that he died on that day in 589. The date was declared a national day of celebration within Wales in the 18th century. St. David (Welsh: Dewi Sant) was born towards the end of the fifth century. He was a scion of the royal house of Ceredigion, and founded a Celtic monastic community at Glyn Rhosyn (The Vale of Roses) on the western headland of Pembrokeshire (Sir Benfro), at the spot where St David’s Cathedral stands today. David’s fame as a teacher and ascetic spread throughout the Celtic world. His foundation at Glyn Rhosin became an important Christian shrine, and the most important centre in Wales. The date of Dewi Sant’s death is recorded as 1 March, but the year is uncertain – possibly 588. As his tearful monks prepared for his death St David uttered these words: ‘Brothers be ye constant. The yoke which with single mind ye have taken, bear ye to the end; and whatsoever ye have seen with me and heard, keep and fulfil’. For centuries, 1st March has been a national festival. St David was recognised as a national patron saint at the height of Welsh resistance to the Normans. St David’s day was celebrated by Welsh throughout their migration, colonization, and settlement of the British Empire including the British colonization of America and British colonization of Africa, and the Colonization of Australia. Thus, from London, England, to Dublin, Ireland, to New York City, New York, to Sydney, Australia, to Durban, South Africa, ever since the establishment of the British Empire around the globe and the Welsh diaspora, Saint David’s Day has been celebrated. Indeed, the 17th century diarist Samuel Pepys noted how Welsh celebrations in London for St David’s day would spark parades in costumes and dragon, with pipes, drinks and confectioners producing ‘Taffies’ – gingerbread figures. St David’s Day is celebrated by Welsh societies throughout the world with dinners, parties, eisteddfodau (recitals Singing and concerts). Additionally, various Welsh Regiments of the British Army utilize aspects of Saint David’s cross, Saint David himself, or songs of Saint David in their formalities during the celebrations. Many Welsh people wear one or both of the national emblems of Wales on their lapel to celebrate St. David: the daffodil (a generic Welsh symbol which is in season during March) or the leek (Saint David’s personal symbol) on this day. The leek arises from an occasion when a troop of Welsh were able to distinguish each other from a troop of English enemy dressed in similar fashion by wearing leeks. The association between leeks and daffodils is strengthened by the fact that they have similar names in Welsh, Cenhinen (leek) and Cenhinen Pedr (daffodil, literally “Peter’s leek”). Younger girls sometimes wear traditional Welsh costumes to school. This costume consists of a long woollen skirt, white blouse, woollen shawl and a Welsh hat. The flag of Saint David plays a central role in the celebrations and can be seen flying throughout Wales, Cawl is also frequently prepared and consumed on St. David’s Day. He invited schoolmate John Entwistle to play bass in the band, and on the advice of Entwistle, invited Pete Townshend to play guitar.the band consisted of Daltrey on lead guitar, Pete Townshend on rhythm guitar, John Entwistle on bass, Doug Sandom on drums and Colin Dawson on lead vocals. After Colin Dawson left the band, Daltrey switched to vocals and played harmonica as well, while Townshend became the lead guitarist. In 1964 drummer Doug Sandom left the band, eventually being replaced by Keith Moon. the band had their first hit single and record deal in early 1965, and Townshend began writing original material. Daltrey was asked to leave the band in late 1965 after he beat up drummer Keith Moon for supplying drugs to Townshend and Entwistle. Daltrey was admitted back to the band shortly afterwards providing there would be no more violent outbursts or assaults., The band’s second single, “Anyway, Anyhow, Anywhere” written by Daltrey and Townshend helped Townshend develop into one of rock’s most accomplished composers, and Daltrey gained an equally vaunted reputation as a powerful vocalist and highly energetic frontman. By 1973, Daltrey was also experiencing considerable success with his solo projects, he went on to release eight solo albums. He also had great success with his acting roles in films like Who’s Next, and Quadrophenia and Tommy, in which he played the lead. Daltrey became the face and voice of the band as they defined themselves as the ultimate rebels in a generation of change. was nominated for a Golden Globe Award for “Best Acting Debut in a Motion Picture” for Tommy. 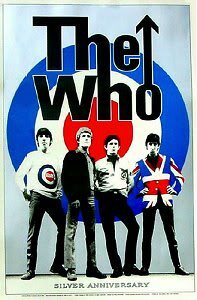 The Who continued performing after the death of Drummer Keith Moon in 1978, but tension continued as Daltrey felt new drummer Kenney Jones was the wrong choice for the Who. In 1980 Daltrey completed a drama called McVicar about British bank robber John McVicar. with other members of the band. Sadly Daltry’s relations with Townshend deteriorated until the Who retired from active touring in 1982. Daltrey turned to working as an actor, completing such high profile projects as The Beggar’s Opera and The Comedy of Errors, The Hunting of the Snark, The Little Match Girl, Buddy’s Song, and Mack the Knife In 1991 he received a Grammy Award. However the remaining members of The band continue to work together sporadically, reuniting for the Live Aid concert, recording songs for Daltrey’s solo album Under a Raging Moon and Townshend’s solo album Iron Man. and returning in 1989 with their 25th Anniversary Tour, which was also the 20th anniversary of the rock opera Tommy. The tour featured a large backing band and guest appearances by Steve Winwood, Patti LaBelle, Phil Collins, Elton John, and Billy Idol. n 1993 Daltrey also performed as a guest on the Chieftains’ recording of Irish Evening: Live at the Grand Opera House which won a Grammy Award for Best Traditional Folk Album and In 1994 Daltrey performed a two-night spectacular at Carnegie Hall titled A Celebration: The Music of Pete Townshend and The Who, and popularly called Daltrey Sings Townshend. which also featured Pete Townshend, John Entwistle, Eddie Vedder, Sinéad O’Connor, Lou Reed, David Sanborn, Alice Cooper, Linda Perry, The Chieftains and others as special guests. The event was followed by a major tour financed by Daltrey and including John Entwistle on bass, Zak Starkey on drums and Simon Townshend on guitar which also reignited interest in Tommy which toured again in 1996-1997. During his long career Daltry has also garnered many accolades. In 2001 Daltrey received a Grammy Lifetime Achievement Award for outstanding artistic significance in music. In 1990 Daltrey was inducted into the Rock and Roll Hall of Fame in Cleveland, Ohio as a member of The Who. The Rock and Roll Hall of Fame also included three songs that Daltrey recorded with The Who on the list of 500 Songs that Shaped Rock and Roll, including: “My Generation”, “Go to the Mirror Boy”, and “Baba O’Riley”. In 2005 Daltrey received a British Academy of Songwriters, Composers and Authors Gold Badge Award for special and lasting contributions to the British entertainment industry. Roger Daltrey also supports many charities & In 2003, Daltrey was honoured by Time magazine as a European Hero for his work with the Teenage Cancer Trust and other charities. In the New Year’s Honours List published on 31 December 2004, he was appointed a Commander of the Order of the British Empire for services to Music, the Entertainment Industry, and Charity. He is also supporter of the Countryside Alliance and has played concerts to raise funds for the organisation. As a member of The Who, Daltrey was inducted in 2005 into the UK Music Hall of Fame.In December 2008, he and Pete Townshend received America’s most prestigious cultural awards – the 31st annual Kennedy Center Honors in Washington, D.C. Daltrey also received the James Joyce Award from the Literary and Historical Society of University College Dublin for outstanding success in the music field, The Steiger Award (Germany) for excellence in music and the Classic Album Award for Quadrophenia from The Classic Rock and Roll Awards in 2011.